One year term of Ali Nejati of Haft Tapeh Sugar Cane Workers Sndicate ended on September 24. Nejati spent one year in prison on accusations which had already been struck down earlier by the lower court. Separately, based on the reports by Human Rights Activists News Agency (HRANA), Tabriz prison officials took Shahrokh Zamani in shackles from prison and he has been transferred to Arsanjan prison in Fars province. Zamani was arrested on June 7, 2011 by the security officials in city of Tabriz and released temporarily on October 19 on bail. He was subsequently sentenced to 11 years in prison and arrested again along with Mohammad Jarrahi on January 2012. Zamani was once before transferred to Yazd prison on May 10, 2012 and returned back to Tabriz on August 6. Two Free Union of Iranian Workers board members, Sharif Saedpanah and Mozafar Salehnia, had their court hearing on October 6 at branch 1 court of Revolutionary Court in the city of Sanandaj. This article, by Morad Shirin of the Iranian Revolutionary Marxists‘ Tendency, was published on the Marxist Revival website. For more on Marxist Revival, see here. 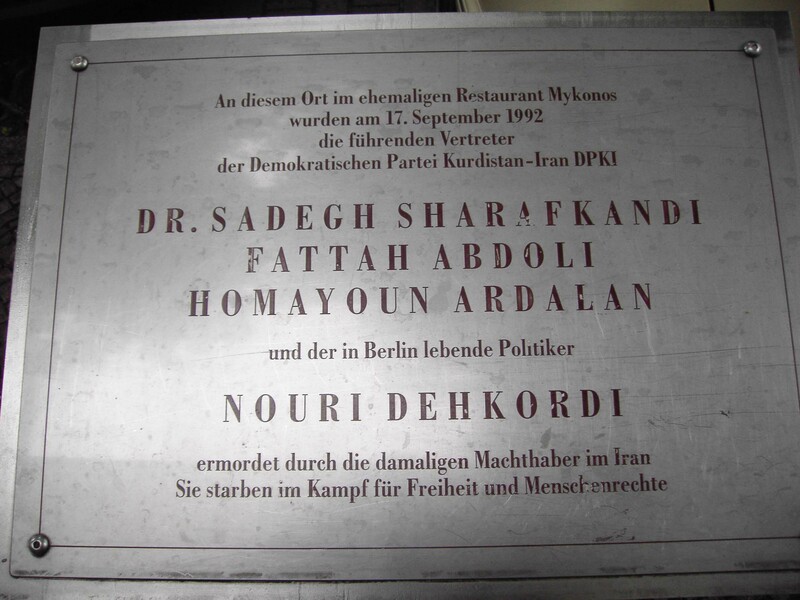 Twenty years ago, on September 17 1992, three Kurdish opposition leaders and another activist were assassinated by the Iranian regime. These assassinations in Berlin were part of the regime’s campaign of eliminating opposition leaders – even those exiled in Europe. Although a number of people were jailed for this act of state-sponsored terrorism, the real architects of the plan are still part of the ruling elite in Iran. On the evening of September 17, at 10:47 p.m., two masked men burst into the back room of Mykonos restaurant and began shooting at the four Kurdish exiles around the table. Three of them died where they fell: Dr Sadegh Sharafkandi, the Secretary General of the Democratic Party of Iranian Kurdistan (PDKI), Fattah Abdoli and Homayoun Ardalan – both PDKI Central Committee members. In addition to these leaders, Nouri Dehkordi, a Kurdish political activist serving as their translator, was struck by seven bullets and later died in hospital. Following a four-year trial a German court found Kazem Darabi, an Iranian national who had ties with the regime’s embassy in Berlin, and Lebanese citizen Abbas Rhayel, guilty of murder and sentenced them to life in prison. Two other Lebanese nationals, Youssef Amin and Mohamed Atris, were convicted of being accessories to murder. Above all, in its April 10 1997 ruling, the court implicated leader Seyyed Ali Khamenei and ‚president‘ Ali-Akbar Hashemi Rafsanjani. It also issued an international arrest warrant for the Iranian regime’s intelligence minister, Ali Fallahian. The court’s unequivocal declaration that the regime’s elite had ordered this assassination followed evidence given at the trial by Farhad Abdulghasem Mesbahi. Mesbahi, the former head of the regime’s intelligence station in Paris, gave first-hand evidence of how the Mykonos assassinations were planned and executed. He provided details about the Committee for Special Operations which is „… a small group made up of the supreme leader, the president, the foreign minister, the minister of intelligence, and the chief of the Revolutionary Guards.“ That means Khamenei, Rafsanjani, Ali-Akbar Velayati, Fallahian and Mohsen Rezai. The Mykonos assassinations were part of a campaign that included the murder of Abdul Rahman Ghassemlou, PDKI’s Secretary General from 1973, in Vienna in July 13 1989. And a month later, on August 26 1989, Bahman Javadi (better known as Gholam Keshavarz) was assassinated in Cyprus in front of his wife, mother and brother. He was a member of the Central Committee of the Communist Party of Iran. Soon after the war with Iraq ended, starting in July 1988, the regime massacred tens of thousands of political prisoners. It assassinated many oppositionists in Iran as part of what became known as the „chain murders“. It also carried out a number of terrorists atrocities like the bombing of AMIA, the Jewish centre in Buenos Aires in 1994. Twenty years on, and despite their subsequent faction fights, the people implicated at Mykonos trial are still all important figures within the regime. The embassies of the Iranian regime are still continuing their surveillance and spying activities against exiled political activists of the opposition.